Download "The LOCATOR concept. 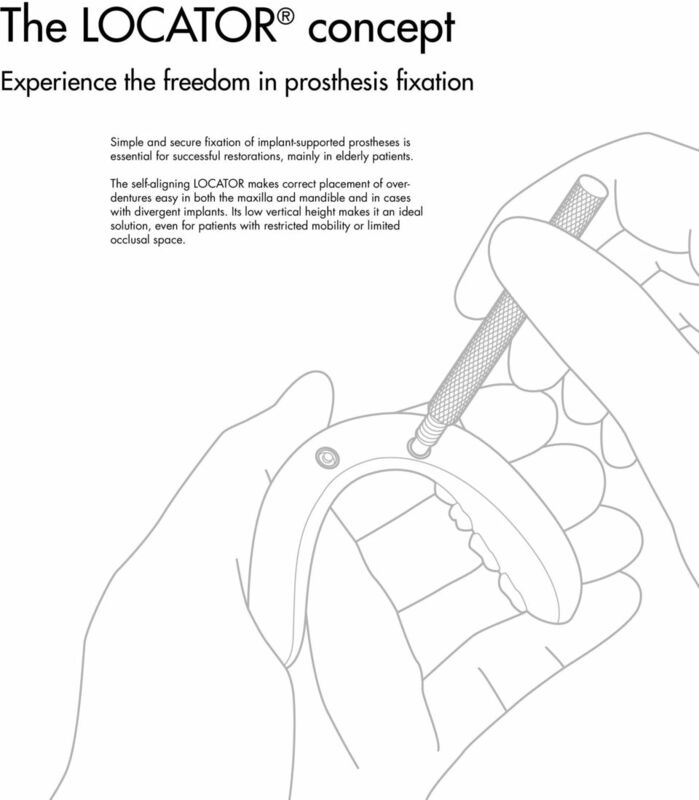 Simplicity and versatility for prosthesis fixation"
2 The concept Experience the freedom in prosthesis fixation Simple and secure fixation of implant-supported prostheses is essential for successful restorations, mainly in elderly patients. The self-aligning LOCATOR makes correct placement of overdentures easy in both the maxilla and mandible and in cases with divergent implants. Its low vertical height makes it an ideal solution, even for patients with restricted mobility or limited occlusal space. 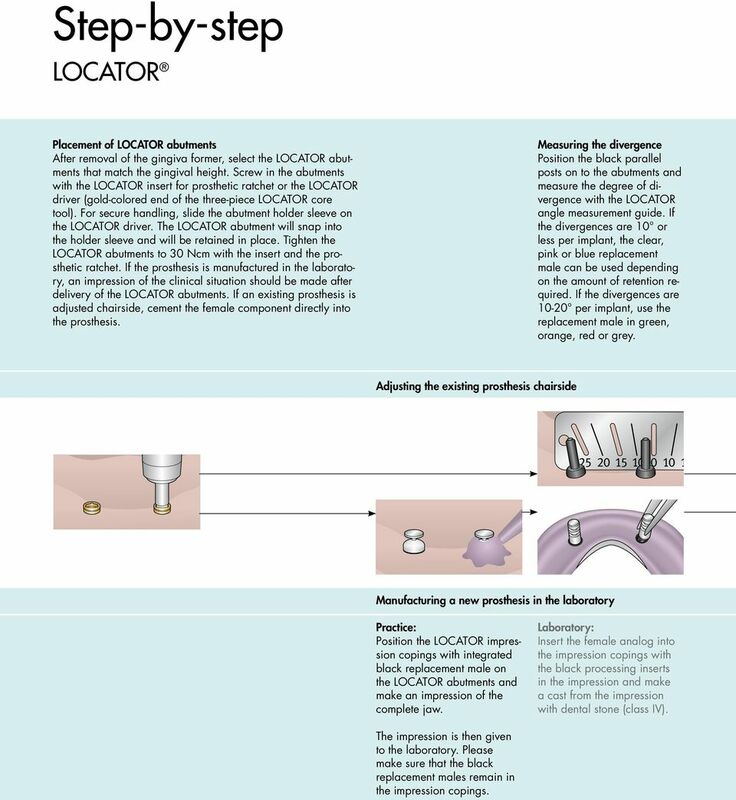 4 Step-by-step Placement of LOCATOR abutments After removal of the gingiva former, select the LOCATOR abutments that match the gingival height. Screw in the abutments with the LOCATOR insert for prosthetic ratchet or the LOCATOR driver (gold-colored end of the three-piece LOCATOR core tool). For secure handling, slide the abutment holder sleeve on the LOCATOR driver. The LOCATOR abutment will snap into the holder sleeve and will be retained in place. Tighten the LOCATOR abutments to 30 Ncm with the insert and the prosthetic ratchet. 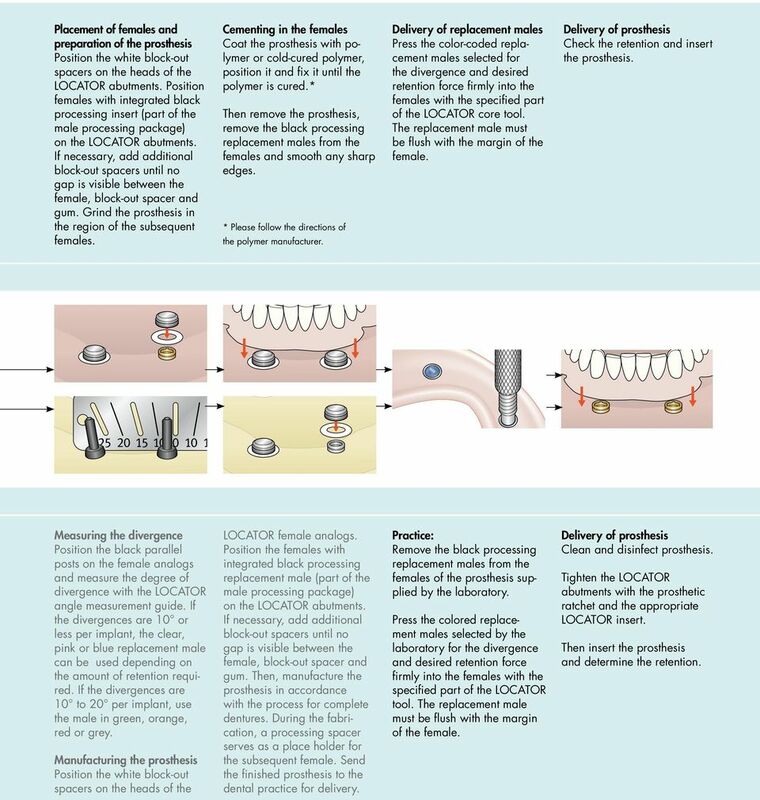 If the prosthesis is manufactured in the laboratory, an impression of the clinical situation should be made after delivery of the LOCATOR abutments. If an existing prosthesis is adjusted chairside, cement the female component directly into the prosthesis. Measuring the divergence Position the black parallel posts on to the abutments and measure the degree of divergence with the LOCATOR angle measurement guide. 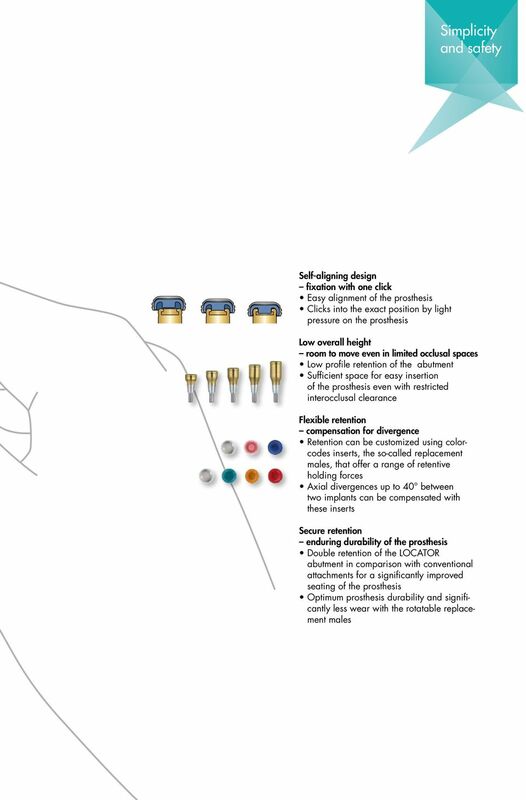 If the divergences are 10 or less per implant, the clear, pink or blue replacement male can be used depending on the amount of retention required. If the divergences are per implant, use the replacement male in green, orange, red or grey. Adjusting the existing prosthesis chairside Manufacturing a new prosthesis in the laboratory Practice: Position the LOCATOR impression copings with integrated black replacement male on the LOCATOR abutments and make an impression of the complete jaw. Laboratory: Insert the female analog into the impression copings with the black processing inserts in the impression and make a cast from the impression with dental stone (class IV). The impression is then given to the laboratory. Please make sure that the black replacement males remain in the impression copings. 5 Placement of females and preparation of the prosthesis Position the white block-out spacers on the heads of the LOCATOR abutments. Position females with inte grated black processing insert (part of the male processing package) on the LOCATOR abutments. If necessary, add additional block-out spacers until no gap is visible between the female, block-out spacer and gum. Grind the prosthesis in the region of the subsequent females. Cementing in the females Coat the prosthesis with polymer or cold-cured polymer, position it and fix it until the polymer is cured. * Then remove the prosthesis, remove the black processing replacement males from the females and smooth any sharp edges. * Please follow the directions of the polymer manufacturer. Delivery of replacement males Press the color-coded replacement males selected for the divergence and desired retention force firmly into the females with the specified part of the LOCATOR core tool. The replacement male must be flush with the margin of the female. Delivery of prosthesis Check the retention and insert the prosthesis. Measuring the divergence Position the black parallel posts on the female analogs and measure the degree of divergence with the LOCATOR angle measurement guide. 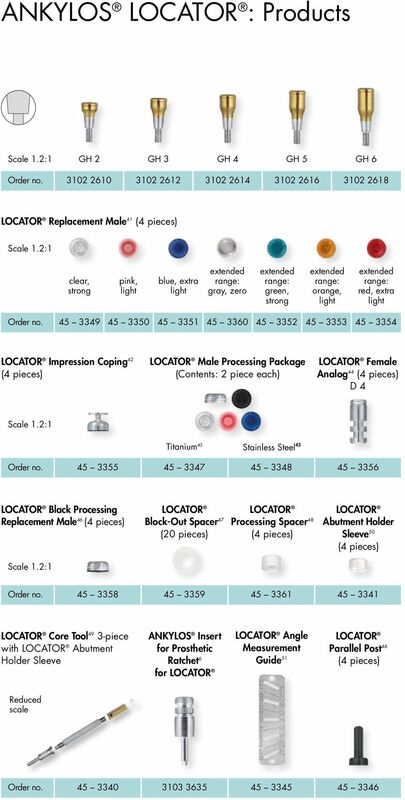 If the divergences are 10 or less per implant, the clear, pink or blue replacement male can be used depending on the amount of retention required. If the divergences are 10 to 20 per implant, use the male in green, orange, red or grey. Manufacturing the prosthesis Position the white block-out spacers on the heads of the LOCATOR female analogs. Position the females with integrated black processing replacement male (part of the male processing package) on the LOCATOR abutments. If necessary, add additional block-out spacers until no gap is visible between the female, block-out spacer and gum. Then, manufacture the prosthesis in accordance with the process for complete dentures. During the fabrication, a processing spacer serves as a place holder for the subsequent female. Send the finished prosthesis to the dental practice for delivery. Practice: Remove the black processing replacement males from the females of the prosthesis supplied by the laboratory. Press the colored replacement males selected by the laboratory for the divergence and desired retention force firmly into the females with the specified part of the LOCATOR tool. The replacement male must be flush with the margin of the female. Delivery of prosthesis Clean and disinfect prosthesis. Tighten the LOCATOR abutments with the prosthetic ratchet and the appropriate LOCATOR insert. Then insert the prosthesis and determine the retention. 6 Content Male Processing Package: Replacement Male Retention force Max. axial divergence 2 x Female 2 x Block-Out Spacer 2 x Replacement Male clear, strong retention 2 x Replacement Male pink, light retention 2 x Replacement Male blue, extra light retention 5.0 lbs, 2268 g 3.0 lbs, 1361 g 1.5 lbs, 680 g 20 between two implants (10 per implant) Order No. Article 0 lbs, 0 g Male Processing Package Titanium (2 pieces) Male Processing Package Stainless steel (2 pieces) 4.0 lbs, 1814 g 2.0 lbs, 907 g 1.0 lbs, 454 g 40 between two implants (20 per implant) All treatment steps are conducted with the three-piece Core Tool ANKYLOS Insert for Prosthetic Ratchet for Delivering LOCATOR abutments manually Insertion of replacement males Removal of replacement males Note: Use the specified torque insert for final placement of the LOCATOR abutment in the implant. Note: Tighten abutments with a torque of 30 Ncm. 8 DENTSPLY Implants does not waive any right to its trademarks by not using the symbols or USX DENTSPLY. All rights reserved. About DENTSPLY Implants DENTSPLY Implants is the union of two successful and innovative dental implant businesses: Astra Tech Dental and DENTSPLY Friadent. DENTSPLY Implants offers a comprehensive line of implants, including ANKYLOS, ASTRA TECH Implant System and XiVE, digital technologies such as ATLANTIS patient-specific CAD/CAM solutions, SIMPLANT surgery, regenerative bone solutions, and professional development programs. DENTSPLY Implants creates value for dental professionals, and allows for predictable and lasting implant treatment outcomes, resulting in enhanced quality of life for patients. About DENTSPLY International DENTSPLY International Inc. is a leading manufacturer and distributor of dental and other healthcare products. The Company believes it is the world s largest manufacturer of professional dental products. For over 110 years, DENTSPLY s commitment to innovation and professional collaboration has enhanced its portfolio of branded consumables and small equipment. Headquartered in the United States, the Company has global operations with sales in more than 120 countries. STEP-BY-STEP INSTRUCTIONS TO PLACE LOCATOR ATTACHMENTS (This is a chairside procedure!) Order of Treatment 1. Make denture. 2. 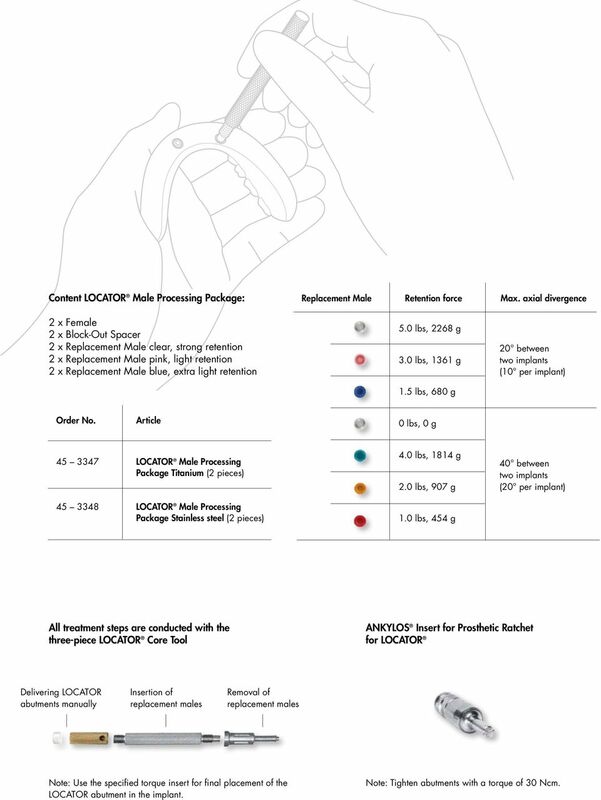 Measure tissue cuff height; order the parts. 3. Pick up the attachments INTRAORALLY. Some products may not be available in all countries. 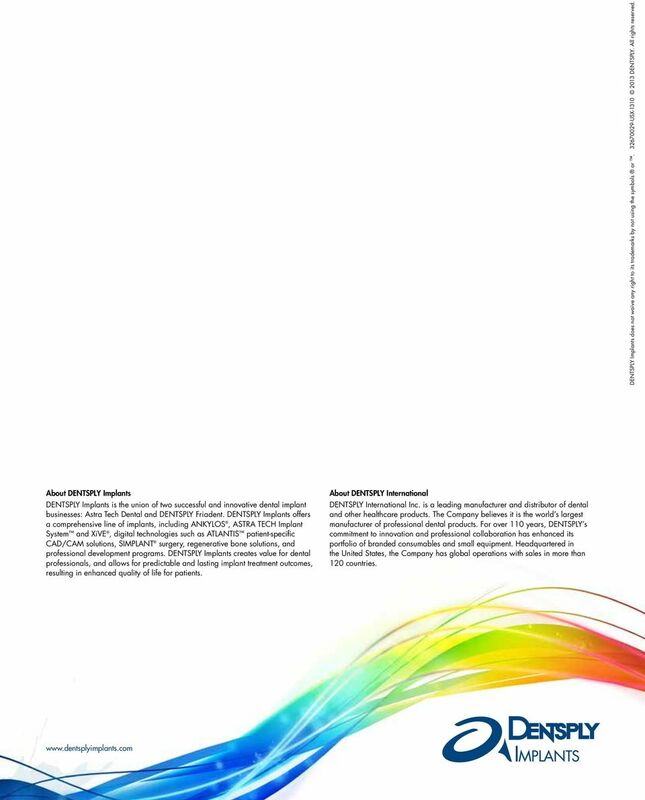 Please contact your DENTSPLY Friadent representative to obtain up to date information on the product range and on availability. Laboratory Order no. GIVE YOUR PATIENTS THE FREEDOM TO EAT, SPEAK AND LAUGH AGAIN. Restoration of a screw retained single tooth restoration in the upper jaw with Thommen Titanium base abutment. Like natural teeth. Treatment with dental implants is a safe, reliable and well-proven solution for permanently replacing one or more missing teeth. 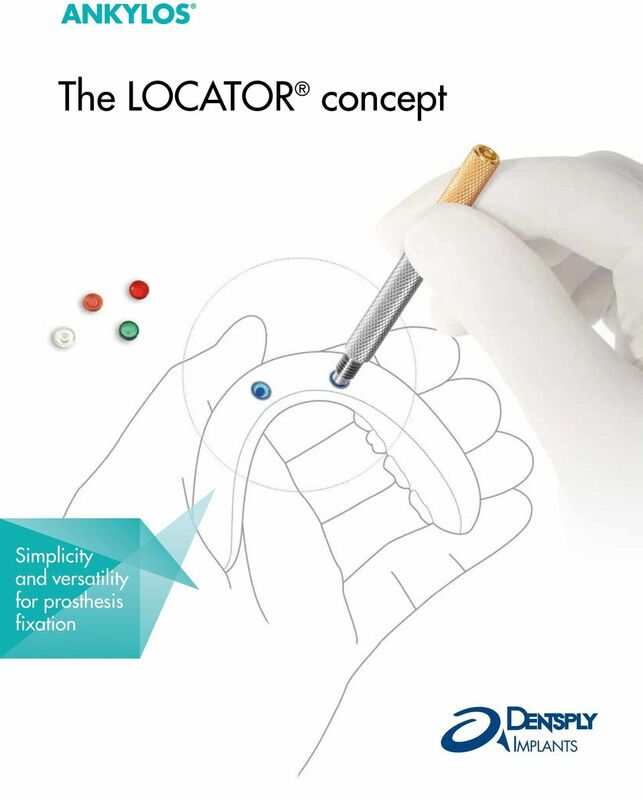 THE LOCATOR OVERDENTURE IMPLANT SYSTEM. AT THE RIGHT PRICE. ONE SIZE FITS ALL. FRICTION For a secure connection. BONEADAPT For immediate stability. ITI Small Diameter (SD) external hex 3.25 / 3.3 external hex. ITI Standard 4.8 internal non-octagon Morse taper 4. More than a fixed rehabilitation. Dr. Abhinav Gupta M.D.S., Certificate D.G.O.I. ( Implants) Assistant Professor(Prosthodontics) Dental College, A.M.U., Aligarh.